I’ve got to give props to Mommy for wanting one of the easiest meals for Mother’s Day ever. She so graciously spares us from having to dress up and attend an overpriced Naples Brunch. None of that for this crew. 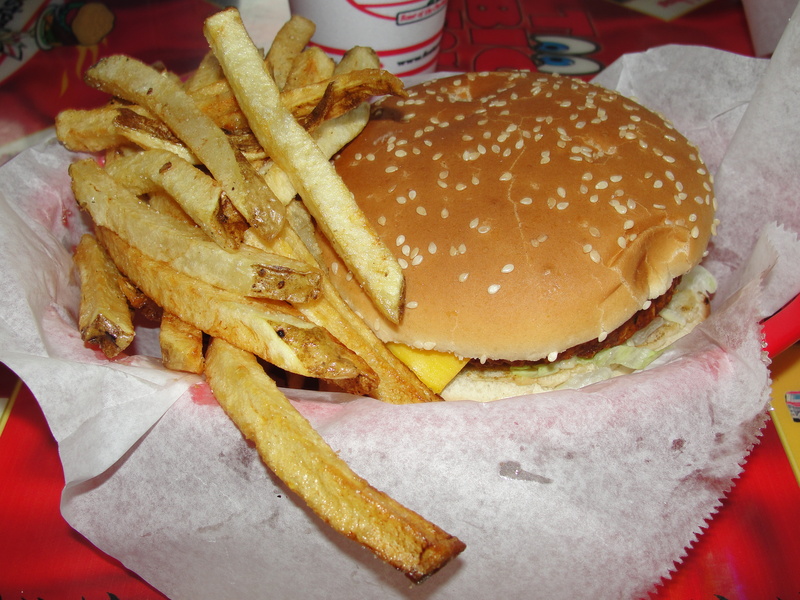 Rather, our tradition is way more simple than that – Burgers. For many years, we went to Five Guys. But, starting last year, we transferred over to Foster’s Grille. As you may recall from my post a few months back, I’m not a fan of Foster’s Grille. But, it is Mother’s Day and if Mommy wants Foster’s, then she will get her some Foster’s. Before even arriving, I knew I was not going to get a burger. I already know that I don’t like them (I’ve had them twice and didn’t like either time). Foster’s does have a pretty limited menu but, I did notice they have a Backyard Garden Burger. Perfect. Nothing better than a homemade Veggie Burger. I ordered the Garden Burger with American Cheese, Lettuce, Tomato, Pickles, Mayo, Mustard and Ketchup along with fries. We also got a side of Onion Rings to start off. I’ve mentioned the Onion Rings before and again they were okay but nothing that amazing. They have a different taste to them and are certainly something I don’t need to have. The fries that I received seemed different then other fries I’ve had in the past. These were fresh cut and at first look, I thought I was going to love them. As I began to eat them, I found that most of them were undercooked. This caused the fry to be very thick inside – like I was eating a raw potato. Not good. The fries that were cooked all the way, were much better and I actually enjoyed them. Even though the fries weren’t all great, I had no problem at all finishing them all off. If only they would have been fully cooked, they would have been some killer fries. Now, onto the Veggie Burger. I was expecting to receive a homemade Veggie Burger. At $7 and change for this combo meal, I didn’t think I would be getting anything different. They make their regular burgers in store so why not the veggie burgers as well? Well, I was most certainly wrong. As I received my burger, I knew right away it was not homemade. 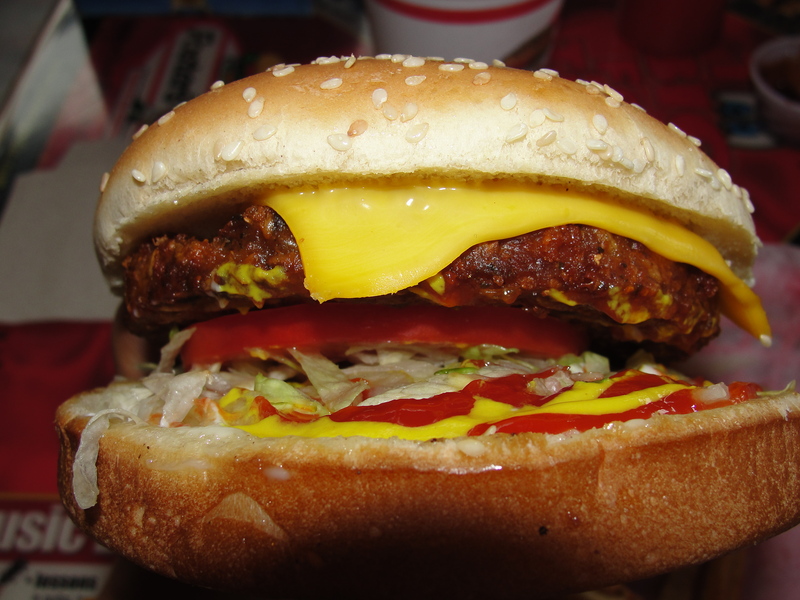 All I could see was the bun – I had to pick up the burger before I actually saw the burger itself. The name is accurate – Garden Burger, it was. As in the packaged, frozen Garden Burger brand. Yup, I paid over $7 for someone to microwave me a veggie burger. Okay, well, at least I like Garden Burgers, right? That is the mindset I used when I started to eat the burger. 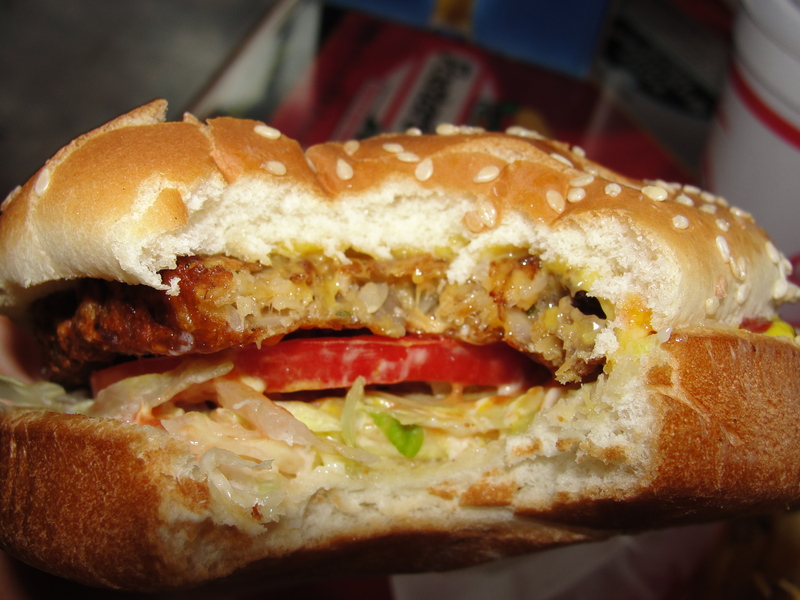 The Garden Burger itself was good – rice & veggie based, it was warm and tasted fine. We used to eat frozen veggie burgers like they were going out of style but, we gave up Soy about a year ago, so I no longer have these on a regular basis. Even though the burger was pretty good, the bun was so insanely large and overpowering, that I could barely taste the burger. Fosters used the same bun that they use on their ½ pound cheeseburger…on their frozen Garden Burger. While the bun was soft, it was just too much. It dominated the flavors far too much. Also, the bottom of my bun was really cold. Odd indeed. As for the toppings, they were all pretty good. The American Cheese was fine but not melty at all. I’m sure this is due to the fact that it was thrown on the veggie burger after it had already been in the microwave. The lettuce & tomatoes were fresh but, they forgot my pickles. There was some but not a ton of mayo, mustard and ketchup and all 3 were just fine. I added additional ketchup to some bites of my burger which really didn’t add all too much. I really don’t know why Fosters Grille doesn’t make their own veggie burgers. If they did, they could better compete with many of their competitors, including Elevation Burger which is also in Gulf Coast Town Center, and offers 2 varieties of veggie burgers. Fosters is a really nice place and the staff is always pleasant. I will continue to go there for as many Mother’s Days as Mommy wants but, will not set out on my own to visit. I can eat there but, with so many better choices available, why even bother? Even thought my meal was nothing to write home about, Mommy enjoyed her meal and, that is all that really matters. Overall, I think we did a good job at giving Mommy a great Mother’s Day – and she certainly deserves it. It’s not that I didn’t like this experience, it’s just that I wasn’t impressed. I left not being full and feeling as if I was totally jipped. All I can say is that when Helpers Day arrives (it is fictional), I will not be opting for Fosters Grille. Was the veggie burger chargrilled? Thanks for taking me. I love the chargrilled flavor once in awhile. The veggie burger was not chargrilled. It was only microwaved. Glad you enjoyed it.